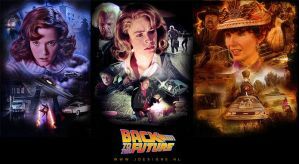 My first uploaded deviation is probably the coolest thing I've ever got to work on officially: The key art to Telltale Games' Back to the Future: The Game. 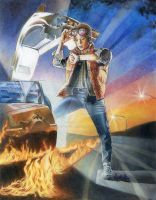 Being a huge fan of basically everything Drew Struzan has ever produced, I was quite intimidated at first, but I really wanted to do "the man" and his classic trilogy of posters justice. Originally coming from 3D graphics (and actually making a living out of that) I have already experimented with a mixed media approach (actually being inspired heavily by Drew's "Conceiving And Creating The Hellboy Movie Poster"-DVD), whereas I start creating the main subjects in 3dsmax while lighting and rendering them with VRay (in this case I got the Marty and DeLorean models from Telltale, although I had to heavily edit and alter these models to work at this size - after all the final artwork is over 11000 pixels tall). These renderings get printed up (colorized blue) and the pencil drawings are created on top of those. Scanned back in I can simply get rid of the blue base image, leaving only the pencil drawing behind, which I colorize in Photoshop (partially using the renderings). Highlights and further details are painted in with my Wacom Intuos4, and in this case the complete background, road, flames etc. are added as well - some painted from scratch (the sky), some based on photos (the clouds and flames), some rendered in 3dsmax again (the asphalt). Back in the 80s Drew's style was rather spattery (it changed a bit during the 90s), so I created several custom brushes in Photoshop to add that well-known texture to the image. The final steps included further color correction to get contrasts and colors just right. I've extended the artwork a bit. The new version can be found HERE. A print of this can now be purchased at the Telltale Games Store. THERE WAS A GAME FOR BACK TO THE FUTURE???? ASIDE FROM THE FEW THE AVGN REVIEWED??? I love this video game! I replayed it at certain areas just to hear my favorite lines again and again Great job! 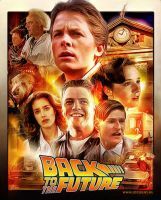 That guy sounds exactly like Marty McFly. you nailed Struzans style for this! Just finished playing the game; I loved every minute of it! You made a great work!Are you the same artist who made the concept arts of all the characters? I knew you could have told me who the concept artist was!Thanks man! Gratulation zu diesem Job, das gute Stück kann sich wirklich sehen lassen! Und ja, was für ein Einstand hier. Danke! Und naja, wurde ja auch mal Zeit.